I received this award from Lou @ The Quiet Life today. Lou is waaay down south in New Zealand but it always feels like she is so close by. She is a smart, fun woman and we have several things in common. Coffee, wine, books, delicious foods, okay not the going to school part but yes to all the rest. I will spare you all my own list because I recently blabbed all about myself in an earlier post. Anyway thanks to Lou for making me part of your circle. I think I will wait until after Christmas to send this one out to some pals. You already added Joanne and she for sure would be on my list. Well of course Lucy, you deserve all of the awards in the blog kingdom. I have to go find the post where you blabbed about yourself. I don't think there will be much there that I don't know, but everyone has figured it out by now anyway. You are smart, strong and funny-a true blue friend who is always there with sincerity and loyalty. I am so happy that my fellow bloggers know this too. Way to go! 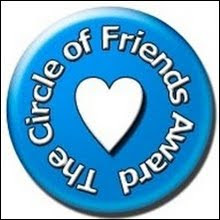 Great to always have a circle of friends!